Wishing you could find unique mother's day gifts? This year you've decided. Find unique Mother's Day gifts and NOW. Because showing your mother how much she means to you becomes highly prioritized as each year passes. So... Give another box of chocolates? She will smile on the outside, but on the inside she will be thinking about all of those calories... .such guilty pleasure! But not quite unique. You remember all of the fabulous meals she cooked. How she instinctively knew what and when to cook your favorite dish or whip up that extra big batch of home style cookies with the huge savory chunks of chocolate. You have enjoyed her cooking all of your life. After you moved out have probably called her on the phone more than once asking how she made this or what it takes to make that. You want to treat her back on Mother's Day. You can take her out to her favorite restaurant, but is that enough? Your Mother has been there for you since the day you were born. And her heart is with you, constant and unwavering. Every year she deserves to receive unique mother's day gifts. Captured Wishes has them. It would take all your toes and fingers and beyond to count all of the things she's done for you, even in a single day; in her own style that seems to be geared just for you. And now you want to show her how much all of that means to you. What unique Mother's Day gifts can express your love and gratitude for all of the things she has done for you? What if you could physically gather up these feelings you have for her and give them back? To reciprocate all the love she's given you without hesitation? Isn't that what we all want? How many times have you wished you could bottle your love so your Mother could have it with her all of the time? Well, now you can. Captured Wishes is dedicated to bottling hopes, dreams and most importantly, love. Of course, your Mother knows you love her. But, wouldn't it be nice to give her a special gift to remind her even when you can’t be there? A super special gift with all of your love inside is just what she needs. A symbol of how huge your love is, yet something she can hold, small enough for the palm of her hand anytime, anywhere. With a gift like that, she will have a physical example of your love, not just words tossed out in the air. On Mother's Day, she is the center of your world and you want to acknowledge and make it the best day of the year for her. You probably feel the same way on special holidays and on her birthday, but this is the ONE day that is set aside universally to celebrated Mothers. 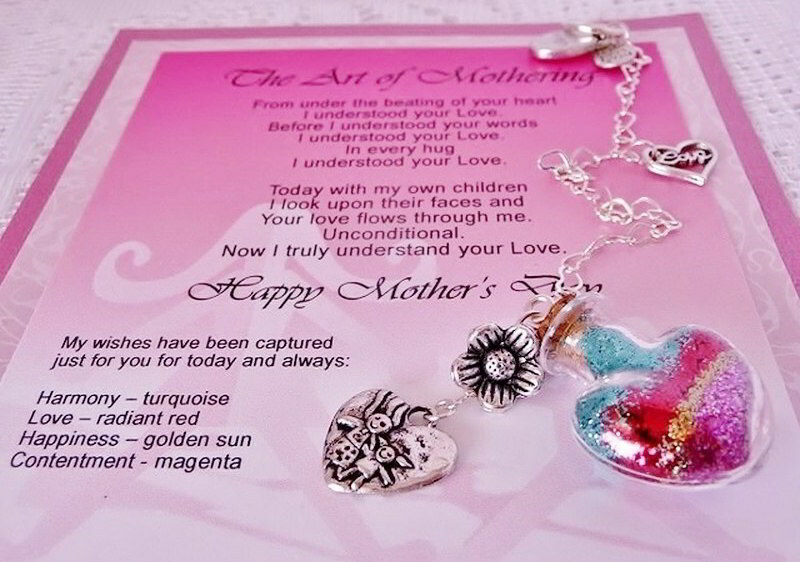 Unique Mother's Day gifts from Captured Wishes let your Mother know every minute of every day how you feel. You don't have to say a word – the gift says it all for you. 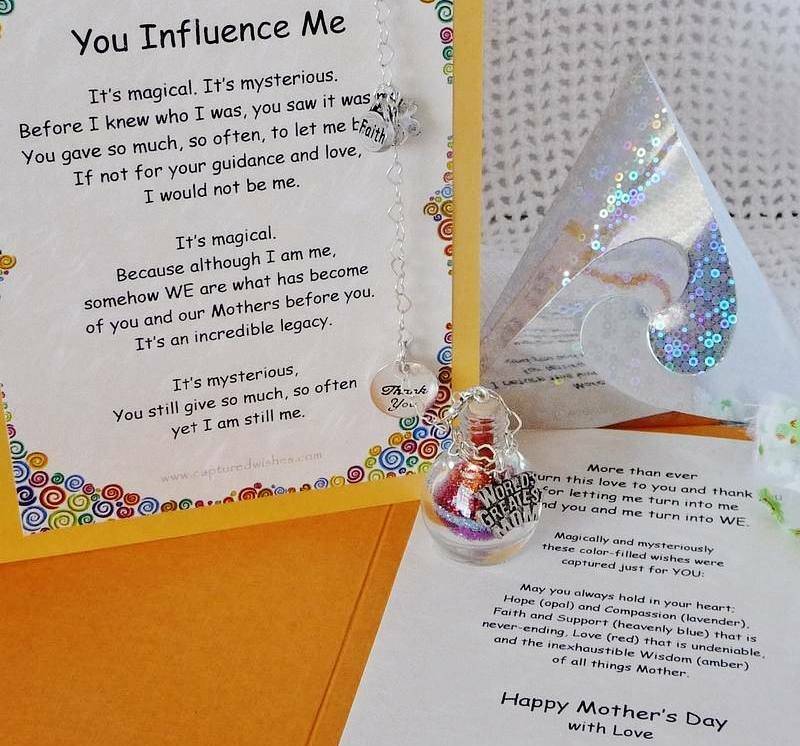 Everything you want to say to your Mother is represented by special colors of holographic glitters that are infused with magical pixie dust. Beautifully layered in a chic little wishing vessel made of glass, this gift is a sure winner to put a smile on your Mother’s face. She just won’t believe how something so small could make her feel so loved. It is such a great way to show how much you care for her and her well-being. Carefully prepared and shipped to you, this Captured Wishes vessel is adorned with charms to match the wishes and a message card that has been designed to expertly say for you what you’ve always wanted to say but didn’t know how. Make Mother's Day super special for your Mother. Or even on the occasion of her birthday. With magical and unique gifts from Captured Wishes, good feelings will be shared by all!